Walsine Pierce: CANDLEMAS DAY! 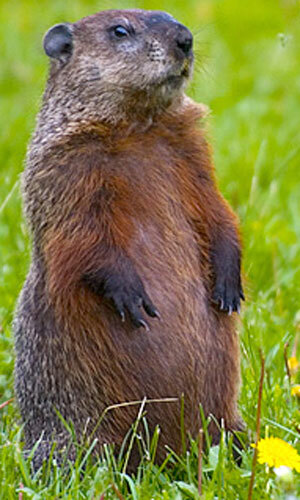 What Will The Groundhog Prognosticate? CANDLEMAS DAY! What Will The Groundhog Prognosticate? WHAT DOES THE GROUND HOG PREDICT? Well, that depends upon which groundhog you ask! 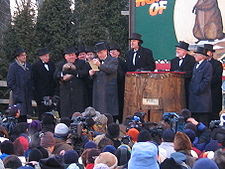 ﻿Some 40,000 will gather in Panxsutawney, Pennsylvania, including the Governor, to hear PANXSUTAWNEY PHIL predict six more weeks of winter. Other groundhogs around the nation will dispute Phil's prognostication. None-the-less, it will be a day of celebration! At Grundsow Lodges (groundhog lodges) fersommlinge (social event with food) g'spiel (plays or skits) will be enjoyed by one and all who will only speak Pennsylvania Dutch. Anyone speaking English will be fined, usually a nickle. The origin of Groundhog Day is an ancient European folk lore where a badger or bear pronogsticates the weather. Then, there is the pagan festival of IMBOLE, the seasonal turning point on the CELTIC calendar on February 1. Want my opinion? Today it will be partly cloudy but mostly sunny, so you could go either way, but the high of 46 and the low of 30 makes me think that spring is coming, and I smile! We have had a very mild winter, thus far, and for that I am indeed thankful!